The fabrication and use of transparent graphene-based neural electrode arrays for applications in fluorescent microscopy, optical coherence tomography (OCT) and optogenetics have been described in detail by the researchers who developed the array. The arrays, which have broad-wavelength transparency from the UV to the IR spectra, could provide opportunities to advance techniques that may not be possible using conventional opaque metal electrode arrays. When University of Wisconsin-Madison engineers announced in 2014 that they had developed transparent sensors for use in imaging the brain, requests for the device came flooding in. "So many research groups started asking us for these devices that we couldn't keep up," said professor Zhenqiang (Jack) Ma. "We described how to do these things so we can start working on the next generation." A blue light shines through a clear, implantable medical sensor onto a brain model. See-through sensors, which have been developed by a team of UW-Madison engineers, should help neural researchers better view brain activity. Courtesy of Justin Williams research group. The researchers’ fabrication methods and surgical protocols are based on the graphene μECoG electrode array, which can be implanted on the surface of the cerebral cortex. Graphene has a UV to IR transparency of over 90 percent, in addition to its high electrical and thermal conductivity, flexibility and biocompatibility. 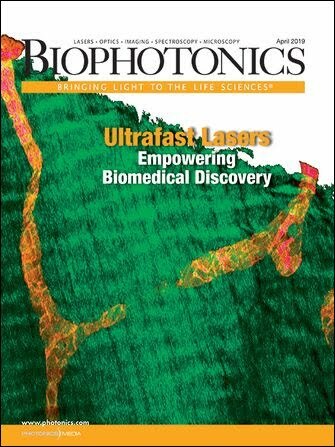 Use of graphene allows through as much transmittance as possible, enabling the clearest image and allowing for the least light loss during optogenetic stimulation. Graphene has a flat transmittance spectrum, making it useful for both optogenetics experiments in the blue spectrum and multiphoton imaging in the IR. The researchers’ wide-spectrum, transparent, graphene-based carbon-layered electrode array (CLEAR) technology has successfully demonstrated the ability to transmit optical stimulation through the array to the cortex of transgenic animals; to reliably record neural responses; and to interface with various in vivo imaging modalities. "Our technology demonstrates one of the key in vivo applications of graphene. We expect more revolutionary research will follow in this interdisciplinary field," said Ma. The protocols may help expand the reach of neurophysiological experimentation by enabling analytical methods that cannot be achieved using opaque metal-based electrode arrays. The researchers are looking at ways to improve and build upon the technology and seek to expand its applications from neuroscience into areas such as research of stroke, epilepsy, Parkinson's disease, cardiac conditions, and other areas of biological research. They hope other researchers do the same. "This paper is a gateway for other groups to explore the huge potential from here," said Ma. The research was published in Nature Protocols (doi: 10.1038/nprot.2016.127).